Ridding the world of polio is going to take a little longer than originally hoped, writes Stratfor, the Texas-based global intelligence company. On 11 August, the World Health Organisation confirmed at least two new cases of children who have been paralysed by a wild-type poliovirus in Nigeria’s northeastern Borno state. Prior to the revelation, Nigeria – once one of only three countries left where polio was endemic – was on the path to becoming polio-free by 2017. When examining outbreaks and epidemics from a geopolitical perspective, we often look at how the disease in question might disrupt economic activities, such as workforce productivity or the movement of people and goods. From there, we determine whether the impact of the disease will be notable enough to influence political, economic or social decisions. But in the case of polio, perhaps the more relevant question is how those decisions have aided – or prevented – the virus’s eradication. Polio cases have become less and less common since a global campaign to combat it began some 30 years ago. Stamping out the virus completely, however, has proved to be a frustratingly elusive goal, thanks to the disease’s nature and the geopolitical realities of the places where it lingers. In addition to Nigeria, Afghanistan and Pakistan are still struggling to wipe out the virus, a task made all the more difficult by the three countries’ remote, isolated populations. The states’ dire security situations often make disease prevention even more challenging: The Taliban are gaining strength in Afghanistan, and opposition is mounting to Pakistan’s transition to secularism. Meanwhile, despite the waning influence of Wilayat al Sudan al Gharbi — better known by its former name, Boko Haram — power in Nigeria continues to be localised, and economic and political uncertainty have clouded the country’s future. Several geographic factors have also hampered international initiatives to fight preventable diseases, including polio, in the developing world. Harsh climates, difficult terrain and secluded population pockets make it tough to control many diseases, let alone destroy them. Moreover, these factors are frequently compounded by social ones, including distrust in foreign aid, inadequate education and poor sanitation systems. Even in this day and age, smallpox is the lone success story in the fight to eradicate human disease worldwide. In fact, when it began in the 1980s, the polio prevention campaign took many lessons from the effort to wipe out smallpox, including the flexibility it required. At the time, India, with its large, poor population and disjointed bureaucracy, had been identified as one of the countries most likely to encounter trouble quashing the poliovirus. But a decade later, India pulled together a massive vaccination campaign that, among other things, targeted migrant workers, a mode of transmission often missed in previous polio outbreaks. In 2014, its efforts paid off, and India was confirmed polio-free. Afghanistan and Pakistan, on the other hand, have not seen the same level of success. That said, the two have made some headway, reporting a combined total of only 19 cases this year, compared with 74 cases in 2015 and over 300 cases in Pakistan alone in 2014. 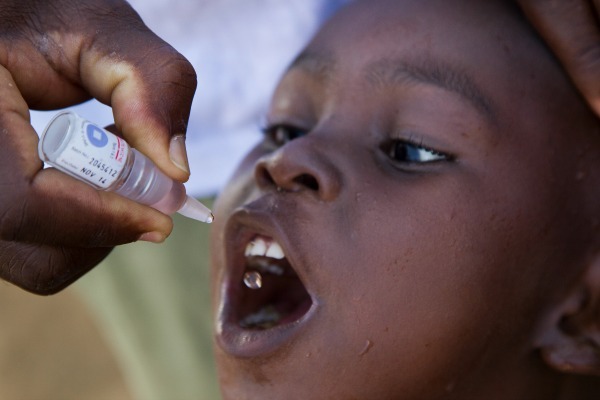 In most of the developing world, vaccination against the poliovirus typically requires multiple doses of an oral vaccine. Healthcare officials administering those doses, then, must either be locals or commit to staying in the area being vaccinated for an extended period of time. Security and local buy-in are requisites for success, and both are in short supply in many parts of Afghanistan and Pakistan. When smallpox was wiped out in the 1960s and 1970s, Afghanistan and Pakistan were relatively open to the West, making the vaccination campaign far easier to conduct. Today, however, trust in Western vaccine initiatives is difficult to find in the tribal regions along the Afghanistan-Pakistan border, in part because US intelligence operatives searching for Osama bin Laden used a vaccine program as their cover in 2011. The following year, local leaders in North and South Waziristan banned the vaccination of children, leading to an uptick in polio cases in the years that followed. Several international aid initiatives subsequently shut down their operations in Pakistan, citing safety concerns. As instability is likely to worsen in both countries in the coming years, defeating polio will not get any easier, regardless of the recent marked decline in cases. The new polio cases that have arisen in Afghanistan this year occurred in regions that have seen heightened activity by the Taliban and Islamic State. Though US troops will remain in the country to counter Afghanistan’s persistent security threats, they will not be able to quell the violence enough to smooth the way for the poliovirus eradication effort. Pakistan will likely see similar hiccups as it gradually moves toward secularism, a development that will be somewhat beneficial to vaccination campaigns. The country’s conservative elements continue to block Prime Minister Nawaz Sharif’s attempts to enact reforms, and they will undoubtedly try to keep him from opening Pakistan to the West. Nigeria’s political atmosphere has not changed as dramatically as Afghanistan’s and Pakistan’s have since the smallpox vaccination movement. Throughout the campaign, the leaders of the country – which had recently gained its independence and was under military rule – were distracted by widespread unrest. Abuja’s victory against smallpox had more to do with the properties of the virus itself than with any comprehensive response on the part of the Nigerian government. Health care personnel, able to vaccinate only a small segment of the population, managed to curb outbreaks by selectively administering doses to patients based on behavioral information. But that approach may not work with polio, as the recent cases suggest. The newest incidents were found to be genetically linked to a poliovirus last seen in 2011, indicating that the latest strain has actually been circulating undetected for five years. As only a fraction of patients with polio exhibit any symptoms, it is also likely that there are more than the two known cases in the area. Boko Haram is largely responsible for the insecurity that has hamstrung vaccination efforts in Nigeria over the past few years. Though the group has weakened since the start of 2015, it continues to threaten the country’s three northeastern states — including Borno state. And as long as this security risk remains, so, too, will the risk that Nigeria’s latest run-in with polio will not be its last.